It’s been a tough week two of our three cars are in the shop (but at least we have a rental), I have too many important projects that need to be done NOW,, it’s tax time, and both my DH and my son are working long hours, so mealtimes are interesting most nights. We even have resorted to breakfast for dinner on occasion. Last night I was able to finish one project, above, which you’ll see here next week. Today I’m working on another one. I did finish two other projects this week. One only had a little bit to do and the other involved too much beading. Beading is not one of my better things because I hate those tiny needles. For one of the colors of beads I wanted to use, my stash had a bottle of size 15 beads in that color. I figured it wouldn’t be too hard to use with the size 10 beading needles I always use. Two beads went on just fine and then absolutely no others would pass over the needle. No problem I thought, I have size 12 needles, they will work, I thought how hard could they be to thread? I was wrong. I could not even find the eye in those needles. I tried lit needle threaders, bright lights, nada. So I had to backtrack and rethink everything. This did nothing to improve my feelings about beads. Once I finish these projects I think I will reward myself with something easy to stitch and pretty. But do they have sharp points? 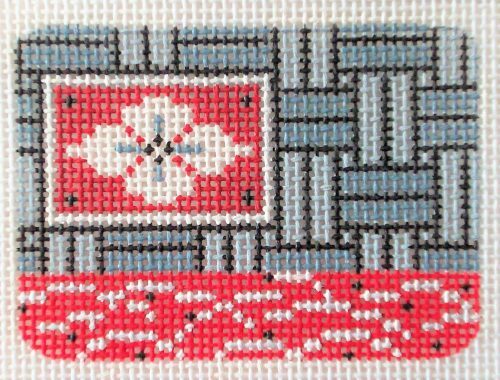 Decades of needlepoint with blunt needles have left me incapable of using sharp needles at all. I even sew buttons on clothes with tapestry needles. I just went back and read your “Problems with Beading” (2016) post. Thanks for the tip about the tapestry beading needle. I didn’t know there was a “safer” needle for beading! I can’t count the number of jabs and pokes from the sharp points. I get so used to stitching with a blunt needle, and a bit careless I guess, that when I bead I tend to forget how sharp the needle i,s and I am always having to try and stop the little drop of blood from getting on my canvas!! Think I’ll do a little online shopping right now…..